I have recently been intrigued by “curry” dishes. Years ago I picked up a jar of “curry” on clearance on a whim and my husband loved it and I was ambivalent about it. Once the jar was gone, I never replaced it. Then a few years ago, just after Ella was born, I watched a show on BBC America and they were always talking about “take away” (the British term for take out) “curry”. What in the world, I wondered, exactly is curry? As it turns out, there is no one definition for curry. It's just a general term. In fact, there are many different kinds of curry from Indian to Thai to Japanese. A curry can be spicy or sweet. 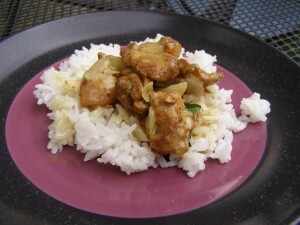 Due to the spices, curries have a definite flavor to them that is quite different. I enjoy the change, but just be ready for something new on your taste buds if you've never tried it (but you should try it — just once!). This makes a lot of sauce. If you want less sauce, omit the chicken broth and use the coconut milk alone. Also, I've read about a hundred curry recipes in the last week and I recommend using the full fat coconut milk. Actually, I recommend you eat full fat everything (unless it's man made!)! This is not spicy — it just has a little heat. If you want it hotter, add another jalapeno. If you want no heat, remove the jalapeno or remove the seeds and veins (while wearing gloves!). For the spices — use what you have. I had cardamom pods so I just threw in the seeds. Add in a teaspoon of coriander if you have it (I didn't). Don't be afraid to make this just because you are missing a few spices! In a medium bowl, combine all spice ingredients and mix. Add chicken to spices, stir to coat well. Allow to sit at room temp for 30 minutes or in the refrigerator for 1-2 hours. Set aside 1/4 cup of coconut milk and dissolve arrowroot powder in the milk. Set aside. When ready to cook, heat 1 Tablespoon oil in a large skillet. Add onions and jalapeno and cook for 3 minutes. Add garlic and cook for 1 minute more. Remove mixture to a platter or bowl. Add another Tablespoon of oil to the pan. Cook chicken in batches, careful not to crowd the pan, until no longer pink. Remove chicken to same dish as the onion mixture. Add chicken broth to the pan and whisk to remove chicken bits from bottom of pan. Add coconut milk and stir. Add in coconut milk/arrowroot powder mixture and cook until thickened. Mix in Worcetshire then add in chicken and onion mixture, basil, and ginger. Stir to coat.